Michael Brazukas presented a webinar with us last month, Strategy Execution is Change Management in Disguise. 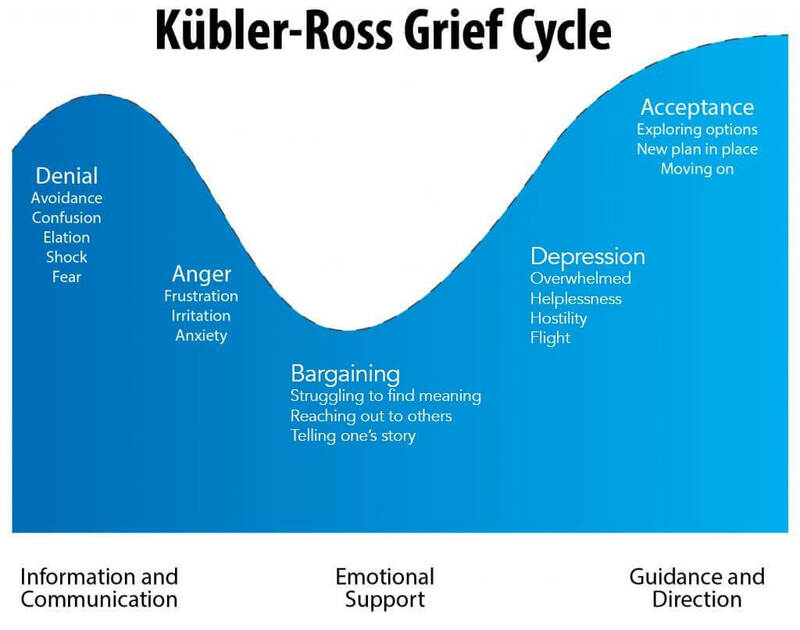 During the presentation, Michael pointed out the similarities between Fisher’s Personal Transition Curve, that depicts the process an individual goes through when adapting to a process change, and the Kübler-Ross model for grief processing. Strategy execution and implementation is more than just managing change – it’s managing loss. Ultimately, the goal of a strategic plan is to change the way you’re currently doing things, with the hopes that you’ll be able to change your process and see better results from operating The New Way. But so much of the success of the strategies you’re implementing relies on the culture you build around the change. If you don’t allow your employees to grieve The Old Way and help them through the transition into new initiatives, they’ll have a harder time adapting to The New Way, or even understanding why. People are creatures of habit; employees operate best when we know what is expected of us, as scheduled. When you move our cheese, we need to understand what the change is, why it’s happening, and how it will benefit us. When you introduce your strategic plan (or operational plan, or merger & acquisition plan, or cost reduction plan – you get the idea – any plan that introduces new initiatives), it’s important to remember that most people aren’t involved in the planning process. The way the plan is initially, officially introduced needs to be carefully crafted so as to address concerns and the what’s-in-it-for-me (WII-FM) right away to start out on the positive path to change adoption. Michael Brazukas calls this the Cognitive Culture Goal. You’ll see (below) that the Change Adoption Curve leads to one of two outcomes – either compliance with the change (“I have to do it The New Way”) or commitment to the change (“I want to do it The New Way”). Creating champions of change will help you make changes to your process that stick, and truly push your organization forward. The initiatives you’re working on need to eventually be implemented and become a new part of your daily operations. You must engage your employees at the WWI-FM juncture. It’s at this point that your team can diverge into either 1) obstinance or 2) taking a leap of faith. This decision is based on whether they’re made to feel threatened, or are given the resources to see the opportunity of making the change. You may not have thought about your strategic, operational, or cost reduction plan as change management before. How do you know what kind of change your plan is dealing with? Think of this as trying to do what you’re doing now, but better. Continuous improvement is the competitive eater always trying to pack in more hot dogs per minute (hdpm). You’re engaging in continuous improvement when you’re doing everything you can to make your packing and shipping process quicker, more accurate, and less expensive. This type of strategy involves scenario planning and is mostly found in commercial organizations. It’s judo strategy. Companies that plan this way focus on the market, their audience, what they do best, where their weaknesses are, strengths and downfalls of their competitors, and how they can find uncontested ground for which they are uniquely positioned to deliver a specifically superior product. Competitive counteraction is knowing your 2-year-old is going to spill their sippy cup at dinner, so you place your indoor houseplant underneath their chair for watering. A great case study of judo strategy is Southwest Airlines combatting their competitors’ complicated baggage pricing models by implementing a “bags fly free” initiative to gain the trust of their target market. Has your organization ever wrapped itself up into a cocoon and emerged as the butterfly of your industry? Netflix became something else entirely when it took the risk to go from a library of DVDs that were fulfilled and shipped by mail, to an online media streaming platform and content creator. Metamorphic transformation is defined by dramatic changes and big risks, much like how your fiancé decided to pivot when he burned the burgers on the grill and decided to serve “blackened beef” tacos for dinner instead. Inventive disruption is creating something brand new out of nothing and radicalizing an existing market, or answering the call of an audience that hasn’t yet been addressed. This sector of strategic change is typically driven by start-ups and venture capital firms with a new way of doing something. Inventive disruption is Uber changing the game of the taxi cab industry. So is that time your Uncle Benny duct-taped a flashlight to a broom and called it the Squirrel Hunter 5000 so he could stop the scratching in the attack once and for all, and then sold it to 3 local (gullible) pest control services. Strategic planning is more than it seems. When an organization commits to executing a strategic plan, change management is required to operationalize the completed initiatives and integrate them into The New Way of doing things. Plan execution as change management cannot be successful without setting the vision, creating a sense of urgency, and identifying advocates and champions of change. Making the reasons for change clear and detailing the expected outcome will help you prepare to deal with complacency, fear, anger, and denial. Making a change is emotional, even in the business world. But, as Michael Brazukas states in the webinar, you can’t over-manage the change. He advises not to stop until The New Way becomes The New Normal. Time is your enemy, so you must persist and be expedient in your process. And perhaps, more than anything, strategic change requires top-down support. To watch the webinar in full and get more tips on how to manage your strategic plan as change management, get access to the video recording and slides here.